The Duplicate Tax ID Warning Message is a measure you can take to help prevent organizations from registering in your site more than once. When registering, if an applicant enters a Tax ID number that is already registered in the system, the Duplicate Tax ID warning message can appear prompting the applicant to reach out to the site administrator before continuing. Attention Applicant! The Tax ID number you have entered is already registered in the system. Please do not create a duplicate account. Please contact the Foundation at example@foundation.com to receive your log on credentials. Please note that the Tax ID warning message is not a “hard-stop.” The applicant can close the message and continue registering. By default this message is turned off. 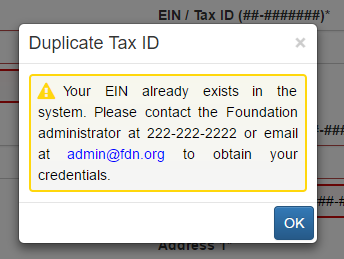 To have the duplicate Tax ID Message added to your registration process please contact support@foundant.com.